Those involved in lean six sigma exam preparation, and aspiring to a black or green belt certification need to be aware of basic lean six sigma metrics. For lean six sigma practitioners, these are necessary statistics to know to evaluate how various processes perform. At the root of lean six sigma is the effort to reduce process failures by eliminating, or at least reducing the factors that cause them. There are 1.4 Defects per Unit in this process. Either formula, using different data points, gives the same result for this process: the average number of defects, or the probability of defects, in each produced unit is 0.35 DPO. 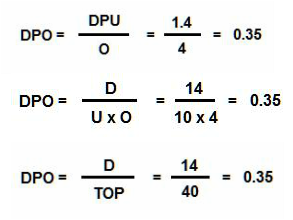 This formula uses the data from the previous metric, DPO. It differs from a calculation of (defective) Parts per Million (PPM) (will be discussed below) in that it accounts for the fact that there are multiple failure opportunities in a single manufactured unit. One should not assume that those opportunities automatically become actual failures. For the metric, DPMO, using the data from the chart above, there is a probability that there are 350,000 defect opportunities. In our process example, 7 defective units (count the number of defectives, not the number of defects) of 10 units produced yields a PPM of 70,000. First Pass Yield and Throughput Yield are synonymous terms that define the number of units successfully produced in a process step, i.e., without defects, divided by the total number of units entering that process. For example, using the chart above, of 10 units entering the stamping process to yield correct dimensions, 6 were defect-free products, or 6/10. To count as FPY/TPY units, they must pass completely through the process without rework or scrap. The First Pass Yield or Throughput Yield of the stamping process is 0.60, or 60 percent. It is important to include only the successfully reworked product in the formula. The rework resulted in a First Time Yield of 0.70, or 70 percent. Our example indicates that the Rolled Throughput Yield (RTY) for all processes is only 16.8 percent. These three metrics are also critical to lean six sigma. They are not difficult to calculate, and in two cases, no formula is required. Cycle Time is simply the time from beginning to completion of a process step. In our example, it might be the elapsed time in the stamping process from the retrieval of a raw material aluminum bar from an input bin, loading it into the press, cycling the press, removing the stamped part, and placing it into an output bin. Each of these segments can be measured separately, or the cumulative of all segments together, but they are timed by a stopwatch and recorded accordingly. Several measurements should be taken to arrive at an average cycle time for the process. Manufacturing Lead Time is the measure of the total time to manufacture a part through its complete value stream, or entire manufacturing process. In our example, this would include both value-added and non-value-added time in process, calculated from the point of retrieval of raw material from the supplier delivery dock to the point of loading finished goods into a shipping truck. The stamping process noted above is just one segment of the value stream, which could even include the transport time of a single, or batch, of components from one internal process to the next, as well as delay time in storage between active process steps. It is important to separate value-added activity (that is, any process activity that adds value to the in-process part) and non-value added activity (that is, any process activity that does not add value, such as transport and storage). For a more complete value stream, the order process, and delivery to the customer’s dock may be included. We have less than one minute of takt time to meet the customer demand. If it seems impossible to fully produce one bracket per minute (let alone less), we must recall that a series of processes like this example can produce multiple units in a batch, so the takt time is achievable. There are other metrics to consider, but most are as simple as these examples. The point is, whether you are preparing for a black belt certification exam, or a green belt certification exam, lean six sigma exam preparation is not a difficult achievement and the results will pay dividends over an entire career.